1 of 5 Heat 1 tablespoon of the olive oil in a large nonstick skillet over medium heat. Add peppers, onion and salt. Cook for 20 minutes, stirring occasionally, until vegetables are soft and slightly browned. Remove to a bowl. 2 of 5 Meanwhile, place shrimp in a resealable bag and add garlic, remaining olive oil, juice of 1/2 lime and chili powder. Shake bag and marinate for 15 minutes. 3 of 5 Puree mango with the juice from 1 lime in a food processor. Set aside. 4 of 5 In same skillet, cook shrimp, 2 minutes per side, and remove to a bowl. 5 of 5 Wipe out skillet and spray with nonstick cooking spray. Top a tortilla with one-fifth of the shrimp, onions and peppers. Sprinkle with 1/4 cup of cheese. Place another tortilla on top and cook in skillet 1 to 2 minutes per side until lightly browned. Repeat with remaining tortillas. 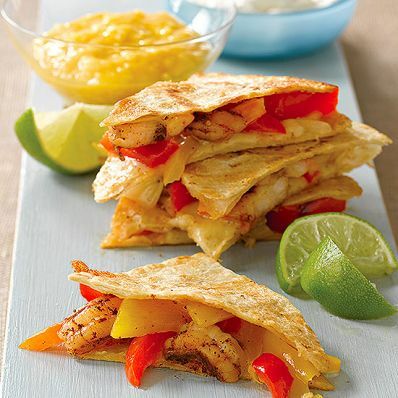 Serve with sour cream, mango puree and remaining lime.